He was a debauchee, a bon vivant, a dandy. He was a blessed PR man who could charm the socks off just about anyone. He was a precursor, an entrepreneur and a trailblazer. He crossed continents and became close with kings and presidents. He was Oscar Wilde’s superior when it came to powerful punch lines. He built distilleries and created one of the world’s largest whisky brands. He was a simple farmers’ son from Perth. This is the story of Tommy Dewar and his world of whisky. but we should say “where’s business”. On the business card of Sir Thomas Robert Dewar you could print almost as many titles as you’d like. Multi-millionaire, art collector, politician, lord, explorer, author, horse breeder, horse racer, big-game hunter, comedian, gambler, distillery director and many more. However, the most striking pretence seems to be the fact that he was appointed “Sheriff of the City of London” in the beginning of the twentieth century. He himself would not agree. On one of his many business cards he wrote:“I have given up lending money for some time. But I don’t mind having a drink. Make it a Dewar’s please”. Thomas Dewar is undoubtedly the most charismatic of all personalities throughout the history of whisky. A wide flora of rumours surround him and he is ascribed both statements and deeds that aren’t always in close connection with the truth. But as he himself writes in his travelling diaries Ramble round the Globe in which he writes about a two-year round trip of the world: “If everybody spoke only the truth, this world would be a better world; but very quiet”. But then again, many stories about him are likely to be true. He was one of the first in Europe to buy a car (third in Great Britain), he was the first to light up London with a gigantic sign advertising Dewar’s Whisky. It caused chaos on the streets when the whole of central London stopped in their tracks to gawk at the illuminated wonder. His firm was also the first to bottle whisky in glass bottles with its own name on the label. Just like all good stories, the tale of Dewar’s world of whisky begins with a poor family whose youngest son wandered off from his childhood hamlet into the great wide world, seeking fame and fortune. He arrived in Perth where the Fates had brought him. There he found employment as an apprentice at his uncle’s wine and spirits store located in the High Street. The year was 1828. John Dewar proved to be an energetic and skilled helper. Soon he became responsible for parts of the purchasing and when his uncle died nine years later, he took over the store. 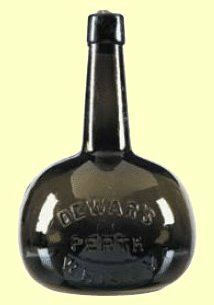 He experimented with blending whisky and started bottling whisky in glass bottles with his own company name, Dewar’s Whisky, on the labels. The business progressed well and the store soon acquired a solid reputation for its first-class selection. 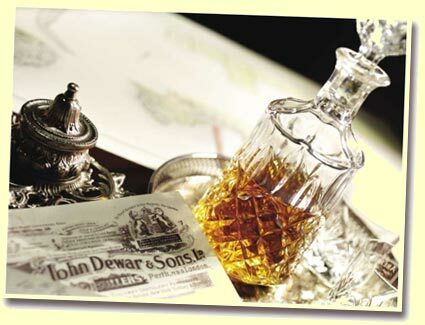 When John Dewar passed away in 1880, his sons John Alexander and Thomas Robert took over the business. The brothers were extraordinarily different from one another. Whilst John Alexander was introvert, unobtrusive, serious and brooding, his little brother Thomas was quite the opposite. He was gregarious and a risk taker. He saw possibilities where others saw problems. His glass never seemed half empty, but always half full, and if it was ever emptied he glanced at it with a smile. He was an eminent businessman. He realised that the horizon had to be broadened beyond High Street in Perth in order to achieve true success. Such a mind can for obvious reasons not be detained behind a register in a small town in the Scottish countryside. So Thomas left to start up a branch in London, whilst John remained in Perth, minding the shop and the accounts. Thomas Dewar arrived in London in 1885. With his charm, his volubility, his refined manners and his social ability, it was a small problem selling his whisky to the finest restaurants and the hip pubs in the city. He was a PR man well beyond average, and with his battle cry “if you don’t advertise you fossilise” he employed artists and drawers to produce astonishing advertising campaigns. He didn’t hesitate to use more drastic measures either, which became evident when his stand was placed in a remote corner at a brewery fair in Birmingham. He then rented a Highlander who performed a complete concert with bag pipes, a manoeuvre that warranted hoards of people flocking around his stand. That Thomas Dewar himself believed that the inventor of the bag pipe had come up with the idea after stepping on a cat is a completely different story. Albeit, as a marketing stunt for Scottish whisky, it was brilliant. More concerts were to follow and the Highlander received the locus he still holds on the labels of Dewar’s. Thomas Dewar soon acquired the reputation of being very skilled. With his winning manners he became the central figure in the aristocratic social life of the metropolis. He grew into a household name in the upper-class families where he frequently could be observed as a humorous entertainer and speaker at dinners. He also began a political career which eventually lead all the way to Parliament. He soon became “Whisky -Tom” to all of London. He proved to have a rare talent for forming aphorisms and punchy proverbs. These maxims were to be published in papers all over the world and were even denominated Dewarisms. With their great variety they are superior to most in that genre. 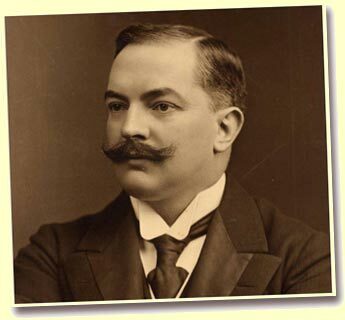 Thomas Dewar soon befriended many influential people, for instance the future King Edward VII as well as the ‘king’ of tea and spices Thomas Lipton, who incidentally was to become Dewar’s travel companion. Later on Dewar was granted audiences with kings and presidents. For instance, the Swedish tennis king Gustavus V granted him the honour of becoming an official purveyor to His Majesty the King. As his business grew, so did Thomas Dewar’s ambitions to find new markets. His watchword was that business has to be reconnoitred, it will not appear by itself. In 1892 he departed on a two-year whisky tour of all the continents of the world. When he returned he had spent £14 000, established relations with 33 agents in 26 countries, and opened a branch in New York. It didn’t take long before Dewar’s White Label was the best-selling whisky in the USA. In the same year he returned from his trip around the world, he published his travel diaries in the autobiographical novel A Ramble Round the Globe. It is indeed peculiar reading for someone interested in whisky, as it tells of a time when the whisky market in most countries was virgin ground, and gives an account of what it was like to travel without aeroplanes and modern communications. It tells of how colonial values characterised a generation of British businessmen whilst building a world market for their products, and of pioneering spirit and optimism in an era where no one could believe that the great wars would soon cast its dark shadows across faith in mankind, business, and humanity itself. Whilst Tommy Dewar was climbing the social ladder and building his whisky brand with increasing skill, his brother John was taking care of business at home in Perth. It grew to success and it was presently possible to make serious investments. To assure a supply of malt, the brothers decided to build a distillery in the outskirts of Aberfeldy by the idyllic river of Tay, not far from their father’s home village of Dull. Aberfeldy Distillery was opened in 1898. In the years to follow no less than seven distilleries were to be incorporated in the company: Lochnagar, Glen Ord, Old Pulteney, Aultmore, Parkmore and Benrinnes. The brothers also built bottling plants in Manchester and London. Both John and Thomas Dewar were raised to nobility for their achievements. They both passed away childless one year apart in 1929 and 1930. A namesake, not relative, Peter Dewar, took control of the business for a few years before one of the founder’s grandchildren, John Arthur, brought the company back into the family. Today John Dewar and Sons is owned by Bacardi, the whisky is number one in the USA, and the sixth most selling in the world. If anyone is interested to learn more about the Dewar brothers’ fascinating life stories, they are strongly recommended to visit Dewar’s World of Whisky and Aberfeldy Distillery. Dewar’s World of Whisky is an interactive modern visitor’s centre that conveys the story of whisky, and is not to be missed. Not only for the sake of Dewar’s whisky and Aberfeldy, but because it is located in such a breathtakingly beautiful location just off the A9 in central Scotland, where Scotland is more Scotland than anywhere else. “I was going through a prohibition State and tried to get some whisky from the conductor of the train, but without success. He eventually advised me to try at a store at the next stopping place, and this I did. – Do you sell whisky? – Are you sick mister, or got a medical certificate? – Then I can’t do it. See, this is a prohibition State, so I can’t sell it; but I reckon our cholera mixture’ll about fix you. Try a bottle of that.